Citywave® makes surfing anywhere in the world possible, without traveling to the ocean or searching for a river wave. Developed by Rainer Klimaschewski and his wife Susi Klimaschewski. 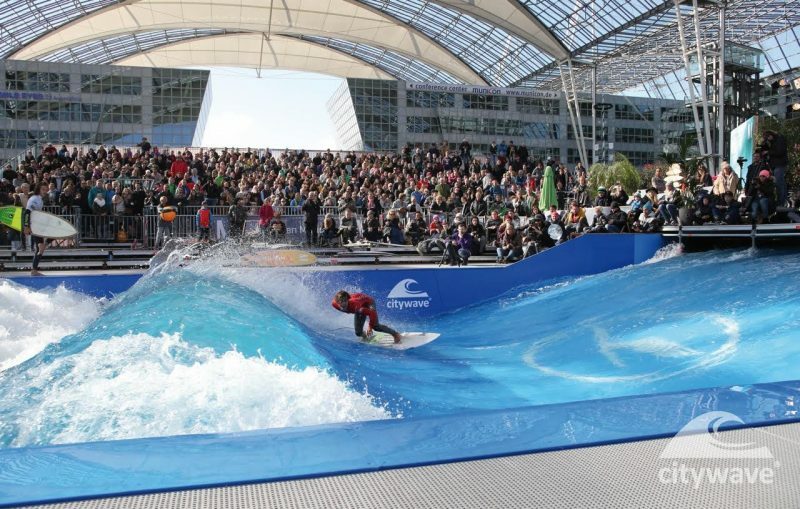 After developing other action sport simulation facilities for the last 20 years, they turned to surfing. Dreaming of famous surf spots in California, Hawaii, and Australia, they dedicated themselves to creating a surfing-machine that made it possible to reproduce turns and take-offs as performed in real surfing. Beginners of any age can start their first experiences safe and stable by using a grab-handle. Intermediates can ride the Citywave and practice maneuvers and experts can rip the wave with jumps, 360’s and powerful turns. Citywave® is a perfect endless wave that consists completely of water from top to bottom. Their unique Deep-Water technology guarantees a wave of up to 1.8 meters (6 feet) with maximum pressure, instead of maximum water speed. This ensures a stable, safe and controlled surf experience. The wave is adjustable in size and water volume to suit every desired skill level and user. Whether beginner, advanced or pro-surfer, Citywave® is easy to modify and it only takes a few seconds to change the settings in order to fit any expected condition. At the heart of the Citywave are huge pump-units, which are produced by one of the world’s largest manufacturers. The size and power of the Citywave’s waves can be regulated by adjustable floaters and the amount of water that is levelled. Therefore the wave can be adjusted perfectly for all skill levels. In this deepwater standing wave it’s even possible to bodysurf. To surf the Citywave you don’t even need a special surfboard, the board you use in the ocean will be just fine. The area around the unit offers huge space for branding. For sheeting there is any option from wood, plastic, fibre or metal. Also for the pool-surrounding there are a number of materials that look great and are functional. In order to imply a certain atmosphere, you have to choose the reception, changing rooms, bar, shops in a certain character: South Sea style with palm leafs, classic with wood or modern in aluminium or synthetic materials.